Flow-Rite Inc., supplies both new and used Mobile Racking Storage solutions. Using our extensive experience in multi-faceted warehouse racking systems, we will design a Mobile Racking Solution that incorporates your requirements. From an initial product and warehouse appraisal, we analyse your product types, pallet criteria, material handling equipment, available warehouse space, current pallet racking systems and warehouse shelving. This deeper understanding of your business operation forms the foundation in designing a warehouse storage solution that maximises your warehouse capacity and operational needs. Mobile Racking Storage Systems are extremely compact and 100% accessible. They are similar to Selective Racking systems only the racking is on wheels that move along floor rails. Each racking shelf remains compacted until they are required to be accessed. 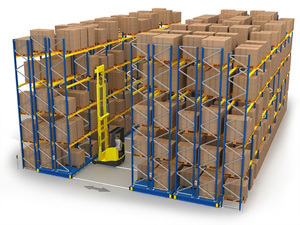 With a press of a button, which can be remotely controlled, electric motors move the Mobile Racking as needed to creating an aisle space in between two racking blocks so that access to pallets can be obtained. Flow-Rite Inc., will analyze your needs to determine if a Mobile Racking Storage solution is the right for you.